Running to a solid two hours, German Hans Weingartner’s film about the realities and ambiguities of capitalism somehow warms to and rewards our expectations of German cinema. Jan (Daniel Brühl) and Peter (Stipe Erceg) are more active than your average socialist activists. They’ve progressed beyond pamphlets. What they do is enter the houses of the rich (the villas) and re-arrange their belongings but never steal—they are not thieves but ‘educators’. They try to educate the haves that their days of plenty will soon be numbered. 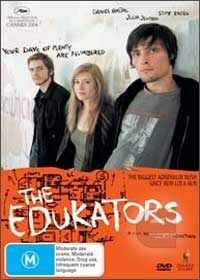 When Peter goes off to Spain for a gig, his girlfriend Jule (Julia Jentsch) winds up in an education session with Jan. The villa they’re trashing turns out to be a Hardenberg’s (Burghart Klaußner), an executive whose Mercedes Jule crashed and owes €95,000. She makes the lesson personal. But alas, there are complications. They have to return to the villa, only to encounter its owner. With him injured, they panic and kidnap him. The foursome ends up in the picturesque German Alps where they spend several weeks discuss political economy. That’s the plot in a nutshell, but as you can imagine, it is very lively. The acting is good, as is the direction. There are both contemplative silences and delirious speed. What actually emerges is that the oppressed and the oppressors under capitalism are two sides of the same victimised coin: sure one has a much more comfortable life than the other, but in terms of culpability, everyone is a cog in the machine. It is this final point that is perhaps the most terrifying of all. The disc has 5.1 sound and 16:9 ratio, so it’s a good watch. Extras don’t extend beyond some stills and cast/crew biographies and a trailer. My only criticism would be the length, which turns out to be an endurance test and the music—I never did like heavy metal. Oh, and can someone explain to me why all radical, anti-corporate types must de rigueur be heavy and committed cigarette smokers? I would have thought the myriad contradictions would be clear to them!